A powerful disk usage scanning and reporting utility for Mac. 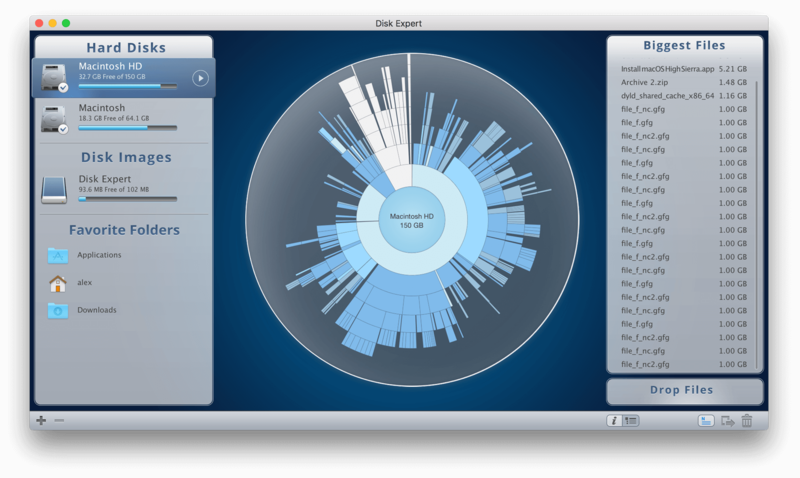 Disk Expert allows you to find the bulkiest content and free up Mac hard drive space. 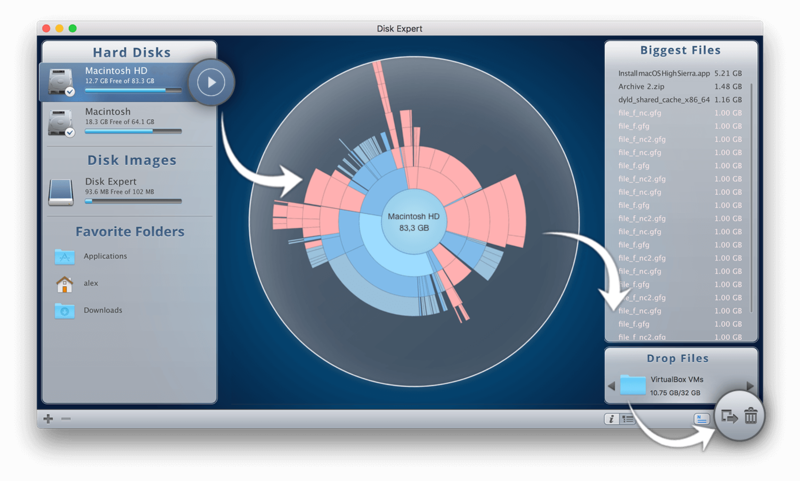 Disk Expert is a disk space analyzer which helps you to quickly free up space on Mac when your Startup Disk is almost full. The application scans any hard drives and even hidden system files, and shows you what is taking up the most space on your disk. and generates a list of the biggest files and folders on your disk. Get ready to be impressed by the fast scan speed of the app. Scan your drive and get the results in less than a minute! View the list of 25 of the biggest files and folders on your disk. Make it simple to clear storage space with Disk Expert. Find even hidden debris on your disk, such as logs and caches of apps, browser data and so on. Add files to the special Drop Lists for further removal or transmission to external storages. 1. Launch the app and click to scan your disk or separate folders. 2. View the space usage distribution and identify the biggest items. 3. Get rid of old unused items which occupy useless drive space. Disk Expert is an essential software tool to help you get out of low disk space. The application is especially helpful when your Mac startup disk is full so that you can quickly detect and handle your “memory eaters” to get more free space. This app is incredibly fast at building a map of where storage is occupied on your drive, and the visual display of it is very comfortable. You can really find space hogs fast and easy. As a graphic designer and mom, I never have enough room on my memory for all my pictures of my kid and all my large design files. This app makes it easy to delete useless and old files that are just taking up all the room I need! 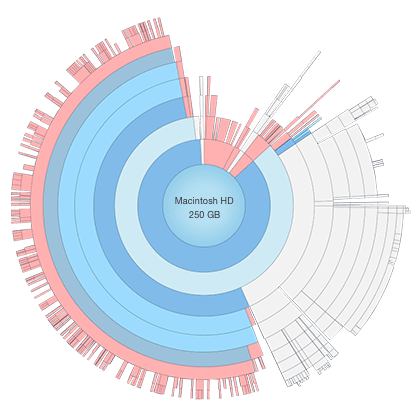 I have used many disk apps to visualize the disk; this works very well and presents a clean user friendly interface, which a stable of my tool kit. This app visualizes your disc in a most logical way and lets you remove files with ease. I would highly recommend it even just to take a look at your os structure. What types of volumes can Disk Expert scan? Disk Expert supports HDD volumes, CD and DVD disks, removable USB drives, mounted DMG images and even folders with FireVault protection. Is it safe to delete hidden items? No, some hidden items are vital for system operations. Nevertheless, some of them simply occupy your precious disk space. 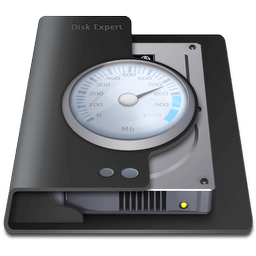 Disk Expert is compatible with Mac OS X 10.10 and later. Can Disk Expert scan my Dropbox? Yes. You can scan DropBox and any cloud storage folder as well.